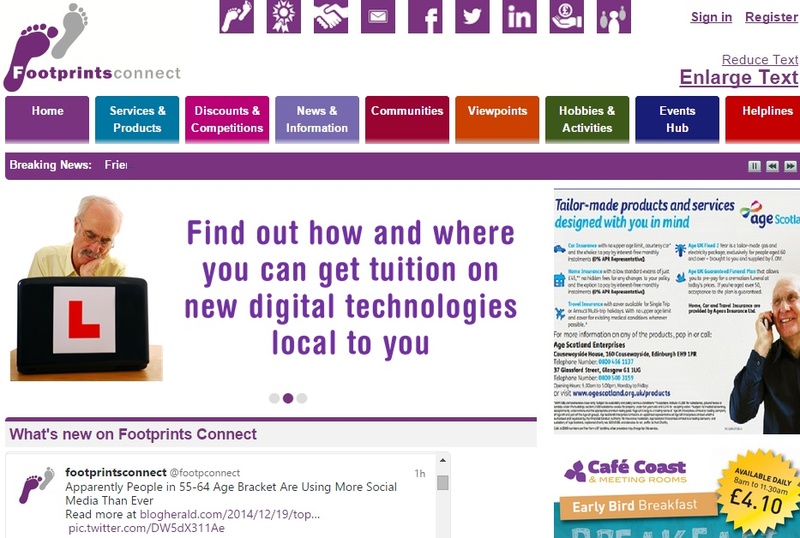 Guest blogger David Valentine gives us an introduction to Footprints Connect – a social enterprise set up to develop a website and associated services to assist people in the 55+ age group to use and benefit from technology. Some older adults find understanding and making use of new technology quite a challenge. The benefits and opportunities to be gained from computers and the internet may remain remote and even threatening. But many people in the over 55 age groups are meeting these challenges and going on to improve their well-being in many different ways (socially, emotionally and financially). For those still to access the benefits of the digital revolution, Footprints Connect, through its website and tutorials is helping older adults, in Aberdeen and Aberdeenshire, rise to the challenge. Footprints Connect grew out of the Aberdeen Silver City Surfers (previous guest bloggers), when it was felt there was a need for an online presence that would give new learners a ‘place’ to use, practice, meet and benefit from their new digital skills. Our website has been developed to offer two main things. 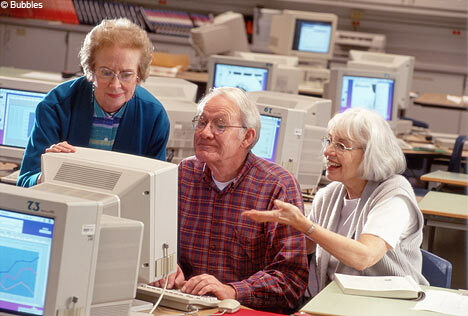 Firstly, to support older adults get over the initial hurdles of accessing and learning to use new technology; and secondly, to provide them with a resource that begins to let them use and benefit from their new found skills. Both of those aims come together in our Trusted Services Directory where browsers can find a wide and growing variety of services including computing tutors, who will provide group and individual tuition in digital skills. Our Trusted Providers are businesses and organisations that have gained the respect of their customers and they have promised high standards of service for our members. Some may also offer free extras or reduced rates for their Footprints Connect customers. As a social enterprise, our core funding comes from publishing Trusted Providers links and adverts. One of our first trusted providers was PC Inspire. We have used PC Inspire ourselves to run some of our Get It On classes and home tutoring. Here we have been trying to bring computer training to people who do not make their way to the SIlver City Surfers, including people living in Aberdeenshire. You can see from our home page screenshot, above, the various sections we have on the website. Under ‘Hobbies & Activities’ we are building up a library of connections to local groups and events that might help people stay involved with favourite or new pastimes. This is also one of several ways the website can help older, and perhaps increasingly housebound, people to stay involved with the wider community. So, along with the other tabs for News, Communities, Helplines (for free, independent advice including free community computing sessions), Viewpoints and our social media accounts on Facebook and Twitter , we are aiming to create a wide ranging resource that will engage and inspire older adults to use new technology to make the best of their later life. This entry was posted in Around Scotland, Digital, inclusion and tagged active ageing, Age Scotland, Around Scotland, digital inclusion, technology by Age Scotland. Bookmark the permalink. That sounds great! I’ll certainly check it out!